PPS pressure mapping sensors have been embedded into some of the most advanced and innovative medical device and consumer device products in the market today. Our expertise in precise, reliable pressure measurements that can be used in a wide range of real-world environments have met the demanding needs of researchers and manufacturers alike. Medical devices, in particular, require high levels of reliability and precision given both the applications within the human body and the regulatory approvals required for such devices. PPS’s proprietary capacitive sensing technology and full-featured visualization and analysis software has provided high-quality results in a wide variety of settings and applications. The solutions highlighted here are primarily developer kits for product development teams to use PPS technologies in their products. The actual licensing and the use of embedded sensors for production products are determined directly with PPS and are outside the scope of these development kits. Please contact us for further information on embedding PPS technology into your medical or consumer health device. The customer wanted to capture pressure mapping information of neonatal & pediatric tracheostomy tube balloons against the trachea. The application involved very low pressures with small diameters in terms of active area. PPS developed custom TactArray and Digitacts solutions mounted inside rigid cylinders of different sizes mimicking the Covidien tracheostomy tubes as well as their competition. And also to compare results from their new device vs. competitor’s devices. Lenox Hill needed to measure pressures of knee joints when flexed. 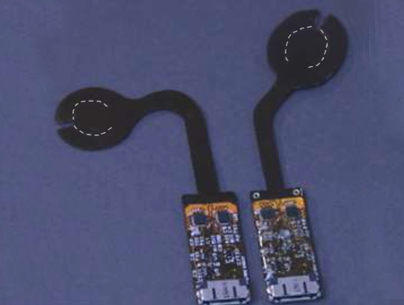 PPS delivered custom 24-elements Digitacts sensors for both medial and lateral sides. These sensors were not only flexible for multi-curved surface of knee joints but could also withstand the relatively high pressures of this application. with different weights and flexing positions. Menicon look for a solution to measure eyelid pressures on ocular surface. Their application involved very low pressures and small diameters as well. on the cornea and the inner surface of the eyelid. NUE was seeking for a tool to capture pressure information of prosthetic devices. This required an instrument that provided form, fit and function for this specific application. Calibration of curved surface was another challenge for this application. NUE was able to collect valuable pressure data enabling improved fittings of prosthetic devices.